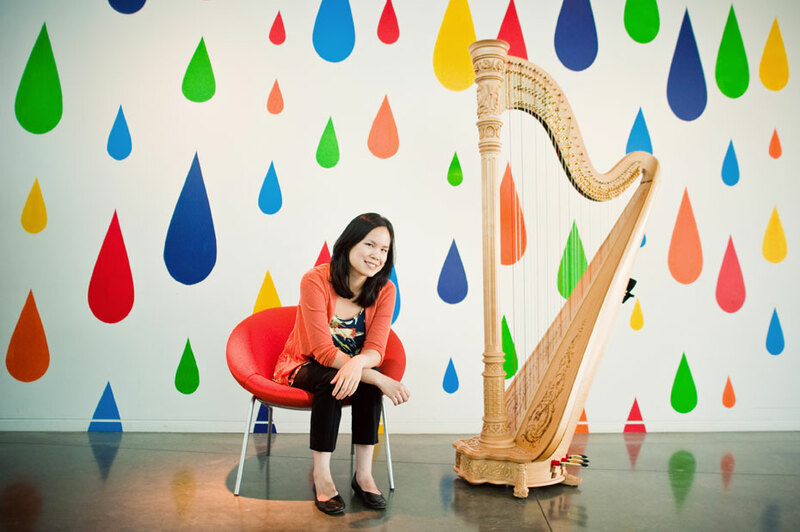 Ruth Mar Tam, Harpist | Teacher | Designer » I pluck strings and push pixels in the Greater Toronto Area. I pluck strings and push pixels in the Greater Toronto Area. Hi. I’m Ruth, a professional harpist based in Toronto, Ontario. I play and teach music, dabble in graphic design, and appreciate good coffee. Thanks for visiting! I’m looking for a harp or piano teacher. I’m planning music for a wedding or special event. I’m searching for some live music around town. I need help with a small graphic or web design project. It was my great pleasure to perform the [Debussy] Sonata for flute, viola, and harp with her . . . she is a greatly gifted artist, she loves to sleep with her fur pillows. She is intelligent, aware, flexible, and a delightful person! View more video and audio samples in the gallery. This site was designed on a MacBook Pro by Ruth Mar, based on the Brunelleschi Wordpress theme. The Adobe Creative Suite, TextEdit, iMovie, and coffee were all involved in the rendering of this product. Hosted by Dreamhost. Photography by Karen K. Wang.